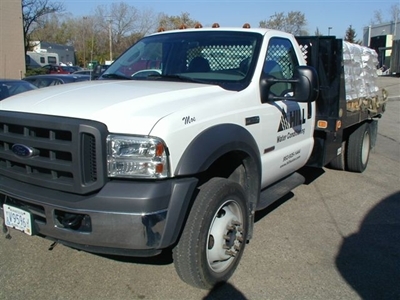 Commercial Salt Delivery, Bulk Water Softener in Minnesota - Robert B. Hill Co.
At the Robert B. Hill Co. we take pride in our commercial salt delivery. From our delivery drivers to our office staff, we can help you decide what program will best fit your needs. We strive to be an industry leader in everything that we do. Our process starts with bulk salt being shipped via rail cars from the Great Salt Lake in Utah. The rail cars come into our facility where the bulk salt is unloaded into one of our storage bins. From there, the salt is either loaded into our Neusalt delivery trucks or into a hopper to be used by our salt bagging team. Our salt bagging team bags 50 and 80 lb. salt bags, which are then delivered by one of our bag salt delivery drivers. Being able to control the entire process enables us to make sure that we do not have shortage and allows us to control the quality and cost of our product. We are the only company in Minnesota that manufacturers bag salt and also delivers Neusalt. Learn more about Neusalt here. The most common program that we offer is our keep fill program. Our salt department will set up a regular delivery schedule depending on your salt usage. This eliminates the need to call in and order salt when you get low. We will take care of making sure you have salt on time and keep your brine tank full. This eliminates the need for onsite staff to lift heavy salt bags and to constantly monitor your salt levels. The keep fill program also allows us to monitor your salt usage and to spot a change in salt usage, which may indicate that there is something wrong with your water treatment equipment. Neusalt is our revolutionary process of delivering salt pneumatically to a storage tank inside your facility. This eliminates the need for bags and allows our drivers to pull up to a connection point on the outside of your facility without requiring access to your mechanical room. These applications typically are for customers that use a large quantity of salt. We can design the system so that we are at your facility as little as possible depending on the space that you have available for a storage tank. A large storage tank allows for lower salt costs and allows for flucuations in your salt usage. Many customers benefit from our bag salt delivery. With bag salt we can deliver solar salt, pellets, mini cube, rock salt and other deicing salt. The majority of our customers use solar bag salt, but for some speciality application customers need pellets or mini cube to fit their needs. No matter what type of bag salt you need, we will make sure that we keep your brine tank full and eliminate the need for onsite employees to lift salt bags. Our delivery area consists of the Twin Cities Metro Area and many cities outside of the metro. A list of counties include; Anoka County, Carver County, Dakota County, Hennepin County, Ramsey County, Scott County, Sherburne County, Washington County, and Wright County.